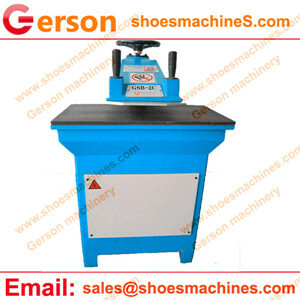 The Pearl Buttons swing arm cutting machine is widely applicable for cutting of various nonmetal materials by die cutter.Such as colorful fastener Fabric button,Brown leather shank buttons,Pearl Buttons and etc. 1.Both hands to operate the machine to guarantee the safety of operators. 2.The swing arm clicker press is the workhorse for many die cutting applications and also a very capable entrylevel machine. 3.The inertial of flying wheel is used to store energy, which saves the energy. 4.The use of time control allows for simple and convenient setting of cutter depth.